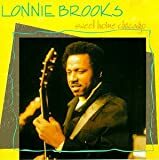 Lonnie Brooks (born Lee Baker Jr., December 18, 1933 – April 1, 2017) was an American blues singer and guitarist. The musicologist Robert Palmer, writing in Rolling Stone, stated, "His music is witty, soulful and ferociously energetic, brimming with novel harmonic turnarounds, committed vocals and simply astonishing guitar work." Jon Pareles, a music critic for the New York Times, wrote, "He sings in a rowdy baritone, sliding and rasping in songs that celebrate lust, fulfilled and unfulfilled; his guitar solos are pointed and unhurried, with a tone that slices cleanly across the beat. Wearing a cowboy hat, he looks like the embodiment of a good-time bluesman." Howard Reich, a music critic for the Chicago Tribune, wrote, "...the music that thundered from Brooks' instrument and voice...shook the room. His sound was so huge and delivery so ferocious as to make everything alongside him seem a little smaller."